You'd think it must be... Everywhere you turn, there is a new book (of patterns, of instructions, of ideas..
Blogger after blogger goes on and on about socks (me included!). 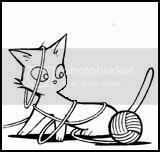 But there are some things that some knitters don't yet know. 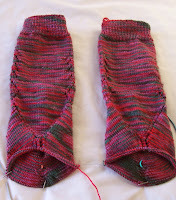 Many socks are knit at 8 stitches to the inch gauge. Not all, but many. 8 stitches to the inch with US size 3 needles(3.125mm). And 8 stitches to the inch with US size 2 (2.75mm). and 9 stitches to the inch with size 0, (2mm). Changing needle size doesn't seem to change the gauge very much. But it changes the fabric of the sock dramatically. With a size 3 needle, I have a soft fabric. With the size 1 needle, a very firm, dense fabric. With the size 0 needle, it's like cardboard!--thick, dense and stiff. The same sort of thing happens with other sock yarns..
and a similar same 9 stitches to the inch on size 0's. But the socks knit on size 2's are very different than the ones knit on size 0's. It's a good idea to swatch with a smaller needles, and keeping going smaller until there is a change in the gauge. The 8 stitches to the inch fabric knit on size 2's is going result in a snugger, more comfortable sock, and longer lasting sock than the one (also 8 stitches to the inch) knit on size 3's. Gauge and fabric also change with different needles.. I find I knit much looser with bamboo—I'm trying to compensate for the tack the needles creates. I knit tighter on metals (aluminum/nickel) I like the slick feel of metal needles. I knit tighter on 2 circ's (and Magic loop) than I do with DPN's, too. The gauge is often the same, but the fabric of the knitting changes. The most common heel stitch is a variation of 'birds eye' stitch. Many knitters use this pattern as gospel--But there are other options. The important thing is understand WHY heel stitch is used at all. 1—Heel stitch is a slip stitch, and like all slip stitch patterns, it has more compact rows. 2—Heel stitch, by its nature, causes the columns of knitting to make offset rows. The Slip stitches straddle 2 rows. This distributes stress on the stitches unevenly. 3—Heel stitch specifically, (and other slip stitches, generally) results in a 'carry/bar' of yarn that creates a double layer of yarn over about 50% of the surface. This combination of properties makes heel stitch a good choice --for any knitting that will have lots of wear—work gloves (the palms) or collars or shoulder saddles.. any place there is going to be wear-a slip stitch like Heel stitch is going to give extra life to your knitting. The denser, more compact rows, means there is more more wool (and more wear-ability!) is packed into a smaller space. The row density is one reason afterthought/peasant heels are rarely worked in heel stitch.. That style heels is shorter (usually) than a heel flap to begin with, worked in a stitch that further shortens the rows per inch would result in a very short heel indeed. The straddled layers means, when a yarn is worn (through) the knitting is less likely to unravel (run/ladder) because the stitches immediately next to any stitch are not worked in the same row. The bar (the carried yarn from slipping a stitch) creates a pad, so even if a single stitch fails, there is yarn between your foot and your shoe. Linen, half linen, honeycomb are equal to the task of heel flaps. If you usually (or just sometimes) wear you socks with backless shoes, you might want to consider a different stitch for the heel! Here are the lastest--I've past the heel and I'm moving rapidly to the toe. a bonus she included in a sock swap we were partnered in last year. If the socks looks a bit strange, well, they are! Details include: reversed gussets, a shaped arch and instep—and clocks! The design is from my head to fingers... I haven't decided on how I am going to shape the toe. I suspect something conventional--but maybe not! Your post reminded me of things I know I knew ... but that I haven't actually spent time thinking about. It is good to think about them, and not just passively know them. Thanks. Now.... I must learn to remember to make my toes in heel stitch. My heels never need darning (knock wood). This is likely because I tend to wear clogs. But my toes -- the TOPS of my toes -- always sprout holes. Perhaps heel stitch can save them. Thank you for all the sock tips. I've yet to start my first pair (although I'm already building a stash of sock yarn), but I plan to soon! Guage can really surprise me sometimes. You are, of course, quite brilliant. Thank you for this blog post, just wish you'd told me all this last December before I had my sock-knitting disaster!!! Anyway, I'm good at learning the hard way - I get so much practice. I have sticky-up toes too, so I might incorporate heel-stitch into my toes in future, great tip.